Their story must be remembered, their legacy passed along. The 36th Infantry Division was organized at Camp Bowie, Texas, on July 18, 1917. Formed from units of the Texas and Oklahoma National Guard, it began its storied history in the Meuse-Argonne Offensive, which led to the ending of World War I. The attack was the largest in military history, involving 1.2 million American soldiers. 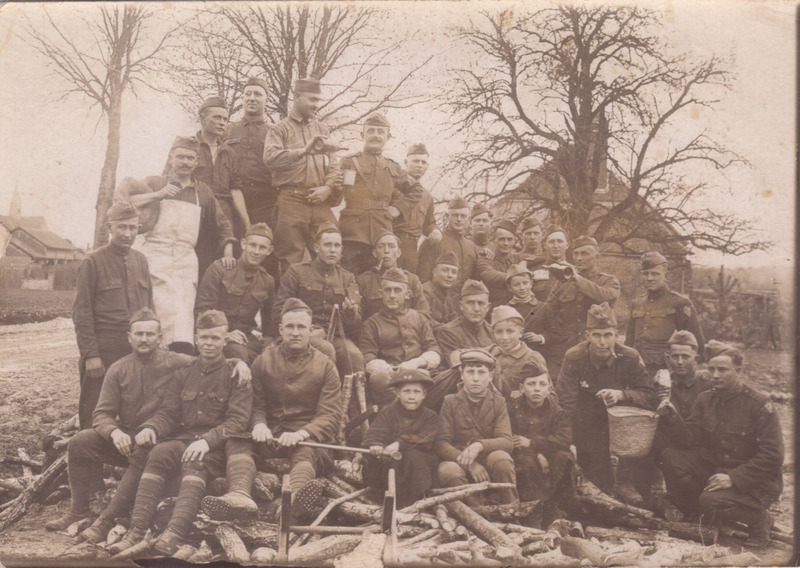 The battle became the bloodiest operation of World War I for the American Expeditionary Force. 28,000 German soldiers died during the battle, and over 26,000 American soldiers lost their lives. It was a crucial part of The Hundred Day Offensive that led directly to the signing of the Armistice on November 11, 1918, and indirectly to the creation of Armistice Day. The division suffered 2,584 casualties, including 466 killed in action. It was a remarkable first chapter in the story to be written by the 36th Infantry Division. Inactivated in June of 1919, the division was again called to duty on November 25, 1940. It began its combat tour by landing in French North Africa in 1943, but its real baptism by fire came when it spearheaded the allied assault on Salerno, Italy, during Operation Avalanche. The 36th repulsed several German counterattacks, suffering over 4,000 casualties during the fight. It went on to attack the Bernhard line, enduring six weeks of intense combat. At one point, while attacking across the Gari River, in 48 hours the 36th sustained 1,681 casualties, including 143 killed, 663 wounded, and 875 missing, out of almost 6,000 men who took part. The devastation wrought by this attack created great controversy and led to a Congressional investigation after the war ended. But the 36th was not finished. 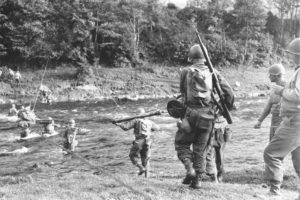 Members of the 36th Infantry Division cross the Moselle River during WWII. The division participated in the assault on the Anzio beachhead on May 22, then drove north and finally entered Rome on June 5, 1944. The celebration was short lived. By August the 36th found itself in France. It steadily advanced in the face of stiff German opposition, suffering substantial casualties. By December of 1944, the division had moved into Germany, advancing north along the Rhine River. As the war wound down, it helped secure parts of the infamous Dachau concentration camp. In a quirky bit of history, members of the 36th fought alongside German soldiers to defend against a Waffen SS attack, the only time German and American forces fought side-by-side during World War II. After 400 days of combat, and nearly 20,000 battle casualties, the 36th came back to the United States in 1945. It was returned to the Texas National Guard in December, 1945, bringing to a close another chapter in its history. A half century later it would be born again, to participate in Operation Iraqi Freedom. The Fighting 36th lives on. The 36th Infantry Division, born at the site named for one of the nation’s most tragic war heroes, exemplifies generations of Americans who have given much in defense of this nation. Their story must be remembered, their legacy passed along. On this Memorial Day, we pay tribute to all those who have given their lives while serving in our armed forces. As the haunting notes of Taps echoes across cemeteries throughout the nation, take a moment to reflect.